Auld Lang Syne: Match Preview. With the warm glow of a trip to the Emirates still pervading the senses I am back at the pre-match keyboard though having read the excellent work done by my substitutes I have much to live up to. Before discussing today’s Derby, I would like to look back to the Wolves game. I feel we dropped two points through a mixture of bad luck and poor management. The bad luck is symptomatic of this season (4 FB’s out for min. 3 months?? ), a deflected shot hits an unknowing Fletcher who diverts it into the only part of the goal not covered by Wn1; he couldn’t repeat that header in a month of Sundays. The poor management is another matter; it was a mistake to rest Ramsey because we were already missing Theo on the right which resulted in having no balance in the team. JD is no RB, a decent defender perhaps, but as an attacking force he is useless. Switching The Gerv from wing to wing just caused him to fade from the game. It was no co-incidence that we looked so much better once AA and AR came on. Onto today: QPR are one of my favourite teams, always have been, BUT this season they have plummeted in my estimation because any team that employs Joey Barton deserves relegation at the very least. And to make him Captain – The Lunatics have taken over the asylum! 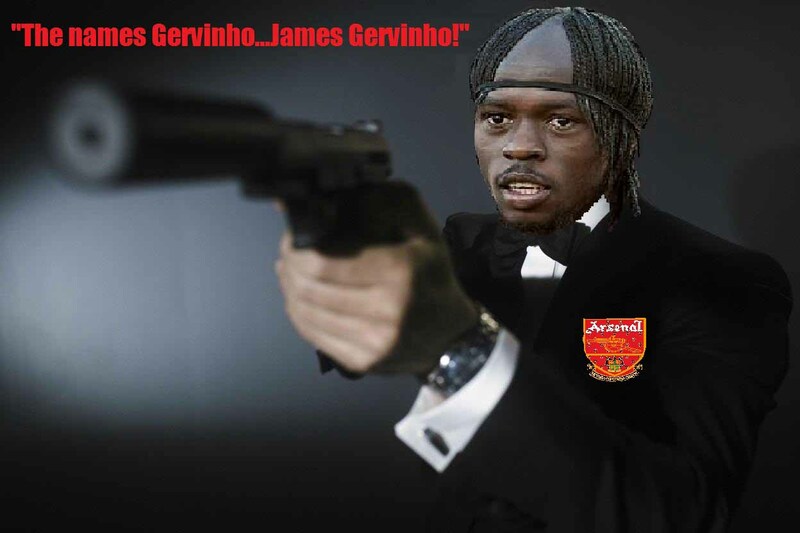 I know Evonne likes him (which is beyond understanding) and as such I shall stop here except to say I hope Gervinho tears him a new one. On the plus side SWP is an exciting but hugely frustrating player who is a bullet dodged. I have to admit I was hopeful he would sign for us prior to his Chelsea stint and even when he went to The Oilers, in fact I was furious with his Dad who encouraged him to go up North. In retrospect I am deeply grateful Wrighty! Islington lad and huge Gooner Jay Bothroyd should start upfront for Rangers, I was there the day he threw his shirt at Don Howe and was one of those who gave him serious abuse for such a disrespectful act, but fairplay to him, he has worked hard and created a fine career. Another ex-Gunner is Armand Traore who is best remembered for taking a knuckle duster to WHL which is evidence of his intelligence – a yoyo career at AFC ended following our blip at OT. Had he stayed he would undoubtedly be playing in red and white this afternoon. Managed by Warnock, QPR have done well. He is the right manager to get a team into the Prem and keep them up. Warnock’s tactics will be predictable and we can expect a very large bus to be brought onto the perfect Emirates bus for the duration of the game but he has some creative players capable of turning a game in seconds – they even have their own Nik Bendtner in Taraabt, a player who believes he is World Class and very (very) occasionally proves it. We will have to be on our guard this afternoon. As to our lads. I was shocked to see both TR and Benayoun start against Wolves and would be surprised to see a repeat. The ARS has worked very well for us and unless there is an injury we should play them every time until the return of Wilshere. Theo is fit, The Gerv has at last scored, RvP is a cert and the defence, though creaky, picks itself. I would like to see everyone shift across one place to the left and play Kos at RB with TV back at CB and Miquel continue his development at LB, but I expect Mr Wenger to take no risks. We have such an experienced bench and yet no-one who can really threaten in attack a problem solved with the arrival of Thierry. I have to say that unlike some of our bloggers I am very, very excited by his return – my man love for TH holds no bounds, to have him back at THOF is my best Xmas gift. In a year when Royalty has been so much to the fore it is fitting to end the year with a Royal Gooner. 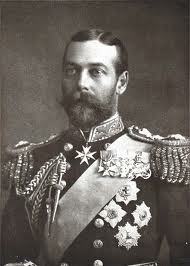 Not surprisingly there are many to choose from but I have chosen a man who started the Royal Gooner tradition, King George V. A fine man who regularly attended games between the wars. This is the final Arsenal Arsenal post of the year. 2011 has brought us both joy and pain, from the beating of Barca to that awful Wembley afternoon but above all it has been a year of great banter, heated discussion, abundant laughter and heart-warming camaraderie on this the best blogsite on the web. Thank you all who have joined in the fun and thank you all for reading. Big Raddy wishes you a very Happy New Year and a 2012 filled with adventure and silverware. In looking back at 2011, in my capacity as a particularly grizzled campaigner of many seasons, I’ve decided to pick out some highs and lows that have stuck in my Peroni-soaked mind, Arsenalistically speaking. We started 2011 very much in the title race and in contention for all four trophies and early on that year my favourite goal of the season was scored. The media can be so far up another team’s sphincter at times that all rationality is lost. Another so called defining moment a lazy media decided to pick up on was the late defeat at Wembley at the hands of Brum FC, then managed by the purple nosed alchy mini-me, McLeish, one of many of the evil Glaswegians acolytes plying their trade in the Premier League. Who can forget (actually who is trying to forget?) Ferguson cuffing Kozzer on the head after his clanger allowed old man Martins to hand Brum FC their first trophy in an age? Classy stuff from another Ferguson (surely must be related to the dark overlord of Govan?). A painful moment and one I was reminded of when a group of Brum FC fans began to goad my younger son, who was wearing his Arsenal 2010-11 home shirt, while on holiday in the south west the following month. Brum FC’s subsequent relegation and the arrest of their owner on money laundering charges proved that football isn’t always a justice free zone. The agony didn’t stop as the next day Bolton scored a 90th minute winner to finish off our title hopes at the Reebok as apparently in the hotel lobby all the other holidayers(deep in the Bolton territory of Burnham-on-sea) were Trotters as they celebrated our demise with glee. The path of a Gooner is, as we all know, strewn with strife and scorn from jealous unknowing rival supporters. A case in point being Tony Pu(gil)lis’s team of hoofers and hyperthyroid Carlton Palmer type players who compounded our misery with a 3-1 trouncing at the S*itannia a fortnight later. By then our season had petered out (culminating in the last home game featuring a protest march before a defeat to Aston Villa) and only the good start to that season prevented our loss of a top 4 spot. The manner of our late season collapse was cause enough for gooner melancholy yet the summer transfer window continued the travails. The late(ish) exit of the homesick Spaniard left a gaping creative hole in the first team which has either not been filled or was filled late depending whether Arteta is seen as a direct replacement or not, an argument for another day however of the new arrivals he is my favourite. In the way that a new girlfriend may have something about her that reminds you of a previous girlfriend you have good memories of, Arteta was like a reprise of the homesick Spaniard that made moving on from our ex number 4 a bit easier. The acrimonious departure of the world class bench warmer referred to earlier was less a cause for sadness and more a sign of the times, in my opinion. The late flurry of arrivals into London Colney was preceded by the slaughter at Old Toilet(a week after a painful home defeat at the hands of the ‘dippers) where a decimated Arsenal team travelled north west and lost 8-2, a coincidence that many of the phone hackers (journalists) proved Wenger was panic buying. An example of lazy, simplistic thinking from writers with an agenda to adhere to, regardless of facts or the application of intelligence. By then our year had well and truly bottomed out and while the subsequent recovery has given cause for optimism it is tinged with the caveat of recent draws against lower ranked teams. The leadership style and sensational form of our present Captain Robin and our improved resilience will need to serve us well at the business end of the season as the days begin to lengthen and things hot up on and off the pitch. A highlight of the season has to be the elimination of the teams from the so called power house of English football, Manchester, from the elite European competition, and the subsequent schadenfreude. Whilst most supporters of other teams would be ecstatic at this being gooners I sensed we then indulged in a bout of, if I may borrow from the Rose the Sage-Stalker from Two and a Half Men, “Glaukenschtoken” – guilt at enjoying the schadenfreude. The sight of Fergie of Red Nose flouncing out of a Champions League press conference where a rogue member of the Press pack suggested maybe the Old Toilet crew were struggling in Europe was comedy gold when viewed in the context of their subsequent exit into the teams that populate the Channel 5 trophy. Due to results for Abu Dhabi FC preceding the last group game their exit was more expected yet the Old Toilet team’s departure was the cherry on the top of a tasty Mancunian cake. The Robin hatrick at the bus top in Fulham is also something to cheer us up in the bleak midwinter we find ourselves in now, especially the swerve and arc which Robin imparted onto his third goal. The image of him kneeling in front of the always magnificent away support, arms perpendicular in supplication it seemed, was a memorable and vivid image encapsulating our slow and painful recuperation from the early season traumas. As 2011 draws to a close I’ll not be too sorry to see it go, from an Arsenal point of view, and I look ahead to 2012 for better times. 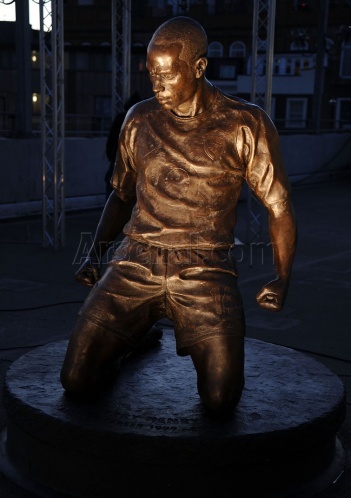 When Thierry Henry scored in Madrid in 2005, the ITV commentator, Peter Drury, I think, called him “the gunner galactico” and since we have now given our record scorer a statue, it seems a fair representation of his greatness. In April 2004 I stood in the lower east stand, just over an hour before kickoff. The gates were open for a morning kick off against Liverpool. A game which after losing and FA Cup Semi Final to Manchester United and a Champions League quarter final to Chelsea only days before had taken on increased significance. If Arsenal were to fail now, that would surely be the end. There were probably only a hundred gooners in the ground. Henry was making a joke of the fitness test Gary Lewin was asking him to perform. Jogging round cones with all the enthusiasm of a teenage boy doing the washing up. Gary Lewin shakes his head with a wry smile. As the five/ ten minute session ends on the sundrenched Highbury pitch both Lewin and Henry walk for the tunnel, Henry seeming to plead like a kid who had not done enough to earn his pocket money. Henry started the game with a back injury and had an awful first half but did manage to lob Dudek. Arsenal ended the half 1-2 down. Months later the players were asked what Wenger said at half time and they replied that the only instruction was to keep passing. Suddenly Ljungberg and Pires where everywhere and pretty soon Pires had levelled the score from close range. Then it happened, Thierry Henry picked the ball up just inside the Liverpool half. Faced with a wall of white shirts he first jogged then sprinted, faced with Carragher a change of feet was enough. Each row in the East and West stands rising as Henry went passed. Then faced with Dudek, Henry side footed the ball to the corner of the net. You often hear the phrase, that lifted the roof, well that doesn’t do it justice. After a week of torture, everybody convinced we would blow it, we came back from the dead and blew Liverpool away. Henry often recalls this to be his favourite goal, largely I assume because of the significance to the team. You see, that is what great players do, they take a bad day, they take fear and panic and they blow it away in the blink of an eye. Henry went on to score a lucky third and Arsenal went on to win the League and become the first English team since football became a serious game to go a season unbeaten. That moment changed the course of football history. Arsenal had other great players, gladiators like Campbell and Vieira, the extraordinary Bergkamp, First goal Freddie and Thierry Henry’s delightful sidekick Robert Pires. As Bergkamp was in his earlier career, Thierry Henry was now Prima Ballerina, the star turn, and elegant mix of dexterity and finesse. The perfect first touch, pace, poise and technique. Henry had his moments though, he sat in tears after the 2001 FA Cup Final defeat against Liverpool. Henry among others missed a hatful in a game that Arsenal dominated and lost. He was out of sorts in Copenhagen 12 months earlier as Arsenal lost the UEFA cup final to Galatasaray. Henry would lead the Arsenal’s scoring charts again in 2001/2 as the Gunners went on to lift the double. Henry and Pires were telepathic by now and the first two thirds of the season swept all before them. The following year Arsenal were to throw away the league title after having held a big lead over Manchester United. Henry had been incredible at times including a stunning hat-trick in Rome and a monumental performance against Spurs at Highbury in a game where for the last ten minutes Henry and Pires continually humiliated Spurs’ Stephen Carr after Carr had flattened Pires in the first few minutes of the game. From 2001-5 he and Arsenal got there rewards for the work the team had put in since Henry’s arrival in 1999 as a replacement for Nicolas Anelka. The trophies flooded in. Dennis Bergkamp played a role in Henry’s development, Henry spent the first two years of his Arsenal career trying to bend shots around the keeper. The Bergkamp-esque curler, something which he eventually mastered and made his own. Bergkamp taught him where to run. Pires taught him how to hang out on the left and let the game come to him. Like Cruyff’s theory of creating space by standing still. Late in a game Henry would stand, hands on hip on the half way line, usually on the left. Arsenal defending a lead, only to spring to lightning paced action should the ball be fed to him on the counter attack. the pumped match winner in Madrid. Whatever you remember King Henry for I am sure you will be recalling it now with a smile on your face. It is also time to dispel a few myths about the great man. Idiots might tell you that Henry didn’t score in the big games, He scored great goals against Manchester United, Real Madrid, Spurs, Liverpool, Chelsea, Roma, Inter Milan and Juventus. He didn’t score against Barcelona in Arsenal’s the 2006 Champions League final defeat. He did go on to play for them though. Henry scored his final Arsenal home goal to win a tight game with Manchester United. As Sky’s Martin Tyler remarked, “a great moment from the great man”. Henry was excellent for Barcelona and won everything he hadn’t already won with England and France. He might not of recaptured his Arsenal form but he did edge Ronaldinho out of the left side of Barcelona’s attack. My favourite memory of the great man is probably this. In 2003 I travelled to Milan to see the second group stage game against Inter. The first a 3-0 home defeat fell like an axe. In the San Siro, minus key players Arsenal won 5-1. Late in the game Henry picked up a ball on the break and sprinted towards the box. He stopped, waited for the Inter defender to catch up, teasing, only to shift the ball past him and smash a left for shot in to the bottom corner. The away end went bananas and I got very drunk in one of Milan’s Irish bars. Arsenal had been slated for the first Inter game and the Old Trafford brawl which followed but as Henry’s shot smashed the net it was all consigned to history. Thierry Henry, The Gunner Galactico. So we lost two valuable home-points today against lowly placed Wolves, and now we are all feeling down? Man City drew against West Brom and Liverpool could not kill off Blackburn yesterday, and neither could Chelsea see-off Fulham. I am as disappointed as anybody for dropping two points against Wolves at home. But the boys gave everything yesterday and it was not to be: 23 attempts on goal, 17 on target and only one goal showing for it (according to the BBC website). When Arsenal play at home and concede such an unfortunate equaliser the most important thing is to find a balance between a calm/focussed approach to find good scoring opportunities on the one hand, and to develop a real sense of urgency on the other hand. The longer the game took the more we lost that balance, as our sense of urgency took more and more control, at the cost of quality. This can happen. At least our players never gave up but kept believing. I am absolutely convinced that playing 5 games in the space of 15 days will mean that the teams who are closely competing against each other will, more or less, end up with the same points tally at the end of that period. There are just too many games in succession for any team to make a bigger leap forward than its direct competitors. At the moment, our direct competitors are Liverpool, Newcastle United, The Spuds and the Chavs. Don’t be totally surprised if by the 4th of January all these teams, as well as Arsenal, will have gathered a similar number of points over the five PL games during the Christmas/New Year period. Last year, most of us leaped to big conclusions when Arsenal did not manage to beat Wigan away at this stage. We had just beaten the Chavs at home and expectations were sky-high. Arsene was criticised for resting too many players back then, and he will probably now be criticised for not making enough changes, or making the wrong changes in yesterday’s game. The masters of hindsight will now start discussing all the things Wenger should have done, and criticising the choices he made before and during the game. 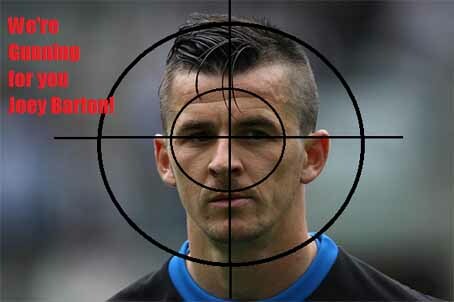 But, I say it again: 17 shots on target and only one went in. Wolves scored a fortuitous goal and we just missed a bit of composure and a bit of luck to win this game. We totally deserved it, but it just was not to be. Did we deserve three points against Aston Villa, a few days ago? Possibly not, but we got them anyway. It’s swings and roundabouts. In a busy footie-fixtures period like this, we need to move on to the next game and try to win that one. And then move on again and try to win the next one. This is a period of getting as many points as possible and to not have too high expectations of catching up with our most direct competitors. We made great progress in the last few months, and we are now consolidating this. Over the next few months, Arsenal will start working towards 3rd and 4th spot in the PL, and to do well in the CL and FA cup rounds. If we can manage our expectations a bit, and I am talking to myself as well here, the second part of the season can become a very enjoyable one. Let’s keep the faith: the New Arsenal has all the ingredients for success – it just might take a bit longer than we want it to take. The visit of Wolves over the last two seasons has produced two wins for the boys in red and white keeping clean sheets on both occasions. Although Wolves have some robust players McCarthy tries to get them to play football. He is one of the few managers who I like listening to in post match interviews as he rarely complains about decisions and outcomes of games, choosing instead to inject some humour in his “call a spade a spade” approach to cross examination. Wolves are yet to take a point off Arsenal in six previous Premier League matches. Arsenal have kept clean sheets in each of the last three contests between the sides. Wolves’ last goal was JodyCraddock’s 89th-minute consolation in a 4-1 home defeat in November 2009. It’s now 13 top-flight matches since Wolves beat Arsenal. That win was at Highbury in 1979 under the management of John Barnwell. Wolves’ only away win this term came in their season-opener at Blackburn. They are winless in seven subsequent matches. In addition to the probability that these stats have to be upset sometime there is the added pressure of elevating ourselves to fourth today. On numerous occasions last year United performed poorly in a game and gave us the chance to leapfrog them, nearly every time we failed to maximise on the opportunity. Today we find out whether most of us are correct to believe that this is indeed a New Arsenal and that they actually have a mental toughness that matters, one that can be used on a football pitch to grind out results rather than the kind that allows one to turn a blind eye to the cry of man overboard. McCarthy has rarely sent his team out to face us with bus firmly parked, but they will almost certainly be up for the battle. The team need to be prepared to win the battle of midfield first and the right to pass and play. For me there is not much to figure out in team selection. I fully expect the same line up for Villa except Song will return. There is also a hint that Djourou could be fit, so he could return at right back. We could see Coquelin at right back again but Jarvis offers a threat down the left flank and I think a more experienced defender in Koscielny will stop any early tail lifting danger. All in all another game where result is more important than the performance which earns it, although perhaps I’ll be greedy and ask for at least two of the three goals Robin needs to surpass Shearer’s calendar year record. 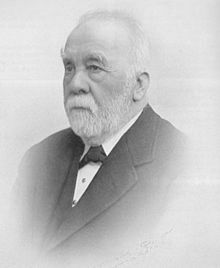 I am struggling with inventors but have managed to come up with Sunbeam – a company founded in 1912 by John Marston and based in Wolverhampton which produced popular bikes, motor bikes and later cars (or at least it did according to wiki). For those going to the Tavern I’ll see you there. First of all, apologies to anyone hoping to find the usual daily helping of wit, wisdom and footballing insight you have come to expect from Arsenal Arsenal. 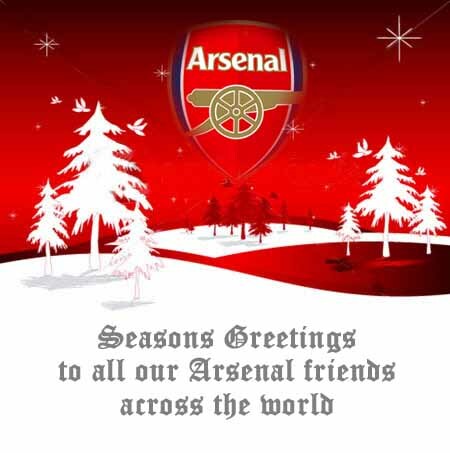 As it’s Boxing Day and there’s bugger all happening from an Arsenal point of view, I’m afraid this is a bit of a quirky Post aimed at the regular AA contributors. But don’t worry, normal service will resume tomorrow with a fine pre-match report for the Wolves game. (A guide to new words formed as a result of cross-generation of individuals via the medium of this blogular site). (verb) to compel an individual to write a headline Post for AA ostensibly through charm, but with the underlying threat of physical violence. (adverb) taking pleasure in the misfortunes of Manchester United. (noun) a tool for abrading the rough edges of a disputatious blog. (acronym) postal district of North London, located somewhere in the vicinity of the Great Lakes. (adjective) a new paint colour from upmarket suppliers Farrah & Ball. Strikingly red and ideal for virgin walls. (noun) a device for giving one a warm feeling on the morning of an Arsenal game. (proper noun) a mysterious land far away, favoured by Friends of Dorothy but occasionally producing wizard insights into all things Arsenal. (proper noun) a medical condition that induces in sufferers an enhanced vocabulary cortex. No cure has yet been found. (noun) a rare mineral noted for its solidness and stability. Billions of years old. (noun) poncey French sofa thing – perfect for watching funny videos from. (noun) slang term for a type of marijuana which produces in users the strong sensation that Arsenal’s best manager lived 75 years ago. (proper noun) popular Cockney seaside resort in the south of Spain. (abbreviation) short for Veritable Cornucopia of Comedy. (proper noun) annual public holiday for the legal profession. (noun) the removal of all the hair from an individual’s head. (proper noun) the capital of Bennigoonarmy. (proper noun) popular television chef who moonlights as a contributor on Arsenal Arsenal. (proper noun) Polish enclave of North London, inhabited by a race of fierce, blonde-haired Amazon beauties. (noun) making fun of fellow bloggers (particularly residents of Evonia) in such a charming way that they can never take offence. (noun) out of an aeroplane door and straight downwards. (verb) to harass or annoy (in particular, to harass or annoy blog visitors making stupid points). (proper noun) a beautiful group of islands set in a turquoise sea of Peroni. (proper noun) unusual form of porter ale, with a full red body and a clear white head. (adjective) pertaining to a female blogger; someone who posts comments about 10 times a year. (noun) a painful growth in the foot. Hurts when you step on it. (verb) Gesture of affection in New Zealand. Often involving sheep. (noun) usually required after undergoing a mancineration. And apologies to any regulars I may have omitted. I’d had about a bottle and a half of good red wine when I wrote it. In the past year we’ve been joined by Arsenal supporters from Africa, Asia, Australia, Europe, North America and South America – only Antarctica to go. Whatever your beliefs, it is a good time to remember and be thankful for what unites us. We are united by our love of The Arsenal and have forged friendships with people most of whom we are unlikely ever to meet; all made possible by the magic of the internet. A big thank you has to go to Arsène Wenger, the players and all the backroom staff for giving us a team of which we can all be proud.